MPAA Rating: Not Rated (contains some language). Running time: 98 minutes. Released by FilmRise. So how do we remember them? Photographs? Video or audio recordings? Social media postings? 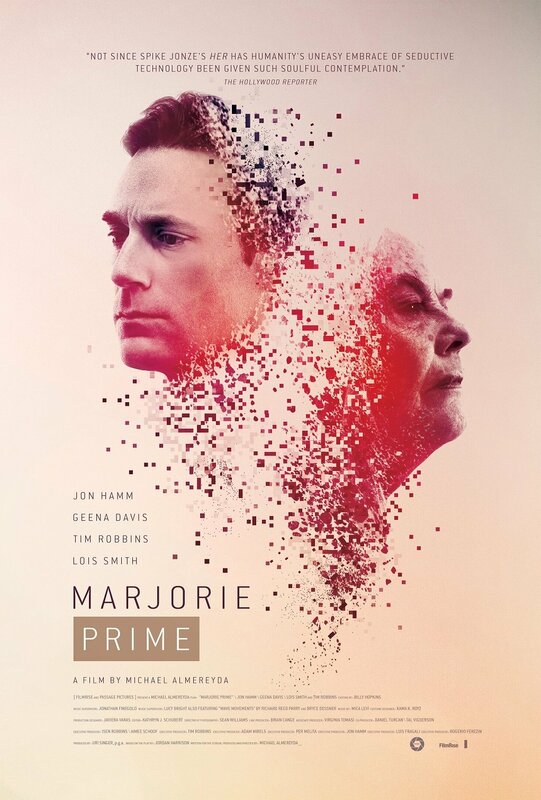 Marjorie Prime takes it a step further, vaulting us into a future where cell phones are panes of glass and interactive holograms of our deceased loved ones keep us company. Based on the stageplay by Jordan Harrison, director (and screen adapter) Michael Almereyda’s makes his film cry out with anguished heartbreak amidst its largely quiet reverie, fueled by solemn, gut-wrenching performances. One of these performances belongs to Lois Smith, whose character Marjorie serves as the nucleus for the entire film. Smith applies her skilled nuance and versatility in creating Marjorie, an injury-saddled widow whose slow slide into dementia seems to be gaining speed. 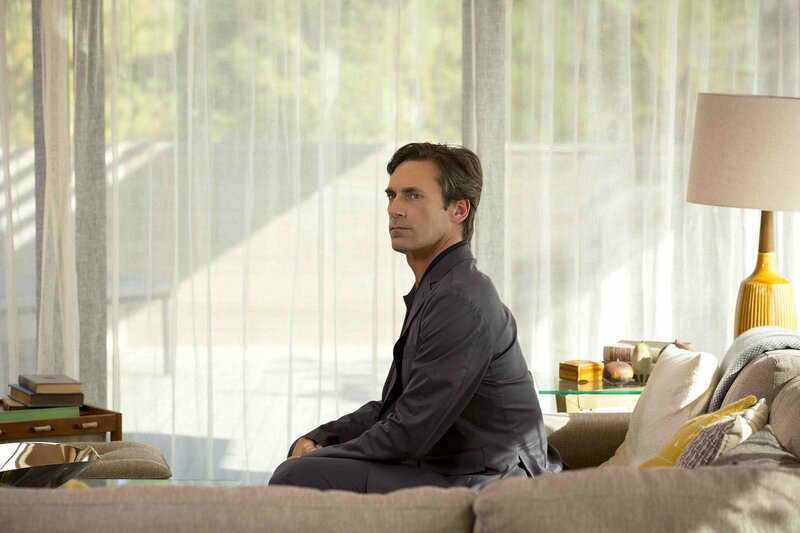 We truthfully don’t know which world her consciousness is seeing – the past or the present – and it’s not getting easier, thanks to the hologram of her deceased husband Walter (Jon Hamm) her daughter Tess (Geena Davis) and son-in-law Jon (Tim Robbins) have set up for her. Curiously enough, it’s the young version of Walter – the one Marjorie fell in love with all those years ago – keeping current-day Marjorie company. He’s a learning program, totally subservient to human needs; the only thing Walter can’t do is interact physically with people or objects. The family’s turbulent history gets layered into Walter’s conversations with everyone, almost as if Walter was our window into their world. This expository dialogue helps us learn about Marjorie’s life along with the Walter program, which Hamm plays as neither friend nor foe. He’s there simply to learn and regurgitate stories to keep Marjorie’s memory on track, hoping to ground her in the real world. Through intimation and emotion, we learn more about the relationships and dynamics of Marjorie’s family more than words could ever hope to convey. Sure, the script helps fill in the blanks, but Almereyda’s “less is more” direction makes the film speak with every pointed silence, every worried glance, and everything left unsaid. 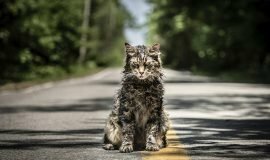 It’s a languid, dreamlike film punctuated by sudden outbursts of fragility and want, coupled with an ever-failing optimism in the face of the inevitable. As our parents took care of us when we were children, the late-life reversal of a child taking care of a parent often happens with either a sense of duty or obligation. We see how burdensome Marjorie is for Tess, as she worries constantly if her mother’s getting her medication, about her ambulatory capabilities, or if she’s even on the same planet as the rest of the family. Davis gives a careful balance between crushing defeat and a very guarded hopefulness for better days ahead for her mother; she makes plain the load she’s carrying both physically and spiritually. Jon’s laid-back, “let the universe unfold as it should” manner doesn’t help matters much, but he’s more of a connection to the world than Tess can be at this chapter in their life. 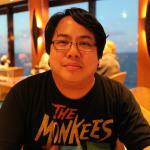 He’s a rational man stuck in an irrational situation, and all he can do is provide assistance where he can. Jon gets backburnered for much of the film’s running time, but his presence is not without purpose, nor is it just a means to an end. There’s one very telling scene between Jon and Walter, which both actors play with daggers to the heart in their own specific natures. 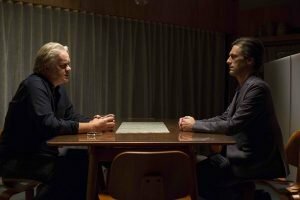 Jon is a tired mess, while Walter is an impassionate sounding board, granted a detachment from the emotional turmoil ripping through Marjorie’s family. 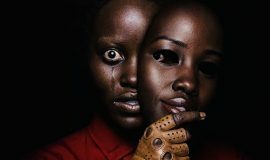 The odd dichotomy of trying to put emotional weight onto a computer program while trying to make sense of family issues might seem a laughable entreatment, a satire meant to poke fun at our overreliance on technology. 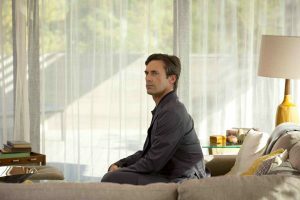 But Marjorie Prime treats it with the same grave respect and dignity the film asks us to give its characters and actors, who earn it with equal amounts of passion and grace.